Hey New Yorkers! 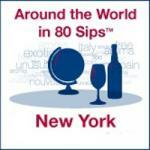 We’re sponsoring Bottlenotes’ 80 Sips Around the World Tasting in NYC this Friday, November 5th and we want to send YOU! We’ve got two sets of VIP tickets (valued at $150/pair) to giveaway and all you have to do is tell us your favorite Gruener Veltliner and food pairing on our Facebook Fan Page before Wednesday evening for a chance to win. Here’s your chance to taste delectable Austrian wine as long as over 80 bottles from five different continents… what a great way to start a Friday night! And while you’re there, don’t forget to show us your support for Austrian wine. We’ll be handing out Austrian wine pins and asking you to Show Us Where You Stick It. Pictures will be posted on the Facebook page and you’ll be trying for a chance to appear in our next sponsored sips mailing through Bottlenotes released November 8th. In case you don’t win, it’s not too late to buy tickets! Just click here. ← The European Wine Bloggers Conference 2010 in Vienna: a Huge Success!